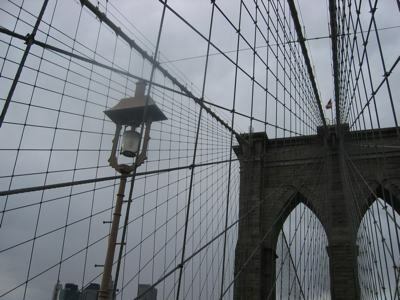 I took this picture last weekend when Marisa and I walked across the Brooklyn Bridge. Perfect, right? So, I’m going up to Court TV this afternoon to talk about cold cases. Every once in a while they want to talk to me about cold cases and this time I totally brainstormed two new ideas, neither of which involve me, but they are good ideas! I’m excited, but given how these things go, NOTHING WILL COME OF IT. But they’re at 42nd and 3rd, so I will take a nice, nostalgic walk back home. I will pass by where Horn & Hardart no longer is, and next to that, where Woolworth no longer is, and next to that, where Mobil no longer is. I worked for Mobil for five years and I will always be grateful to Mobil because they led me to my life now. They paid to send me to graduate school which led to me starting Echo which led to someone actually freaking paying me to write a book. Thank you, you great big oil company, you! Oh! My one good Mobil story. Actually, I have two, but here’s one. Mobil’s inter-office mail was sent using the initial of your first name and then your last name. When I worked there someone high up in disaster recovery was named Stu Horn. So occasionally I’d get his mail and, as a result, the inside story on disasters around the world. I remember one from the Exxon Valdez oil tanker crash in 1989 (my last year at Mobil). I don’t remember many details now, actually, just that Exxon was not accepting all the help that was being offered, which I remember being amazed at at the time. There could have been a perfectly valid reason, I just remember being surprised. It was a terrible, terrible crash (of course I remember all the birds coated in oil) and you don’t need every bit of help you can get? Oh wait. Maybe they already had enough, or too much, of whatever was being offered. I remember down at the Trade Center, everyone wanted to help, and there was only so much room and so thousands and thousands and thousands of people were turned away, and they had to find other ways to help. In any case, I will take a nice long walk home, contemplating all the things that are no longer, and probably the fact that soon, I will be one of those things. I can’t help it! Who can avoid noting that?? I won’t dwell on it too much, but there it is! American Idol Thoughts. What the hell?? Haley and Michael-Jackson-Level-Weird Sanjaya, and not Sabrina and Sundance (both of whom had problems, but still)?? I’ve been checking your blog since I read “Waiting for my Cats to Die” last December. I’m so glad you enjoyed my very first comment! I’m really looking forward to your next book. Aside from being a shameless cat lady (two traditional Siamese, Victor and Beatrice), I also have a long history of occult/paranormal interest. My undergraduate degree was in cultural anthropology, and I managed to tweak my program of studies to include all sorts of supernatural topics. These subjects are, of course, essential to human’s cultural history, but most anthropologists are too snooty to touch them. Anyhoo. It’s nice to sorta, kinda meet you! Victor and Bea say ‘hi’. That has to be one of the biggest AI rip-offs, ever! The judges seemed pretty gobsmacked that Sundance was booted off. And what about Antonella’s expression when she was told she was out? That was pretty priceless.